Are you ready to #BreakFree this Friday, Saturday, & Sunday in Anacortes? Most of the vital info you need to take action on the water is available here. The type of collective actions that puts Big Oil on notice and inspires the masses to join the climate justice movement is only possible IF we make it possible, together. So don't forget to volunteer now for the many water team roles on land prior to and after each of the actions. CLICK HERE. Join us for as many of the 4 main Kayaktivist events as you can! You can partake in most of the water events and take part in a lot of the on-land happenings.Check the more detailed schedule below to ensure you arrive early enough to get your boat and briefing. Friday 10-2pm trainings and the first and most sunny raft-up and imagery mobilization. Sunday Mass Actions (Family Friendly and Affinity Groups). Reserve/Rent your boat ASAP (sliding-scale) for each of the 4 main water events CLICK HERE. Select the event, then the type, single or double, then the level of price that fits your means. Use the Peer-to-Peer Boat Sharing Board HERE (give it a try, but to guarantee a boat for the weekend’s events, be sure to rent one). Water Specific Text Alerts - Stay connected to updates and vital logistics for on-water happenings by texting @WaterTeam to 23559. What to Bring: Kayaktivist Go-Bag HERE. Bring a spare of any item for you and a fellow kayaktivist. To provide for protection of Heron, Eel Grass, maintain good relations with the ordinary people and boaters of Anacortes and respect the wishes Swinomish tribe, we ask you only land and launch from the areas we've designated. We will circle up for pre-launch logistics briefing before each event. 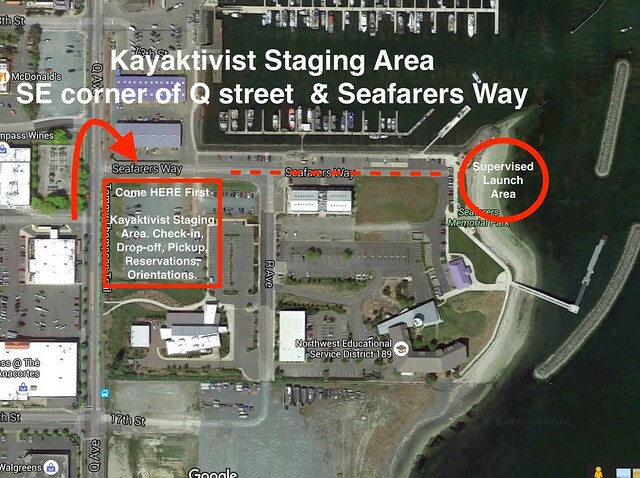 The BreakFreePNW Kayaktivist Staging Area is located at SE Corner of Q street and Seafarers Way in Anacortes, WA. We will be setting up on Thursday and packing up on Monday. We can use your help and your patience as we collectively work to keep people safe and effective on the waters of the Salish Sea. Feel free to bring your own paddle craft there to store it for the weekend. We will have 24hr a day security and important information and supplies for being safe and effective on the water. Ecosystem Protection: Please review the INFO HERE so we can embody the stewardship we aspire to engage in. Amid the toxic refineries there is an impressive showcase of resilience among the flora and fauna. We hope you will help us ensure that our presence is the element that impacts them the least throughout this weekend. 10am - 2pm Friday display the power and beauty of collective action on the water. Together, we'll sound a clarion call for a rapid transition away from dirty energy and juxtapose that with the refineries in the background. Join us for the first (and mostly sunny) flotilla in Anacortes with a giant kayak raft-up, hoisting of huge banners, and more. We need 24 double kayaks on the water to mobilize our illuminated message. $10-160 sliding scale pitch-in for Kayaks HERE. The 2.8 mile paddle each way is recommended for intermediate paddlers. Share the paddle strokes with a fellow Kayaktivist by opting to rent a double. Kayaktivists are invited to paddle to March point and land in the designated area to then join thousands of fellow change agents converging at the Indigenous-led event. Celebrate the centuries of resistance and resilience of the original peoples. Bear witness to both the beauty of Padilla Bay and the destruction and ecocide by Big Oil. We'll paddle together to strengthen our spirit for the courageous journey of positive transformation we must embark upon. 8:30pm : Procession of Luminary Salmon begins. With our bodies and our boats we'll draw a large red line to signify our commitment to take a stand against the threats to our communities and reckless despoiling of the planet. Together we'll protect our children from catastrophic climate change, stop the poisoning of our communities, and call-out the unsafe conditions workers are caught in. Help mobilize imagery on the water, showcase people and paddle power, and demand the pivot towards a renewable powered society that benefits everyone. 11 am - 3 pm : On-water red line raft-up. Mass Actions. P.S. Please reserve your kayak today if you want to have one this weekend.